Welcome to 2018, where schools are permitted to hold pep rallies for students to “get them excited” about standardized tests (like that ever worked!? 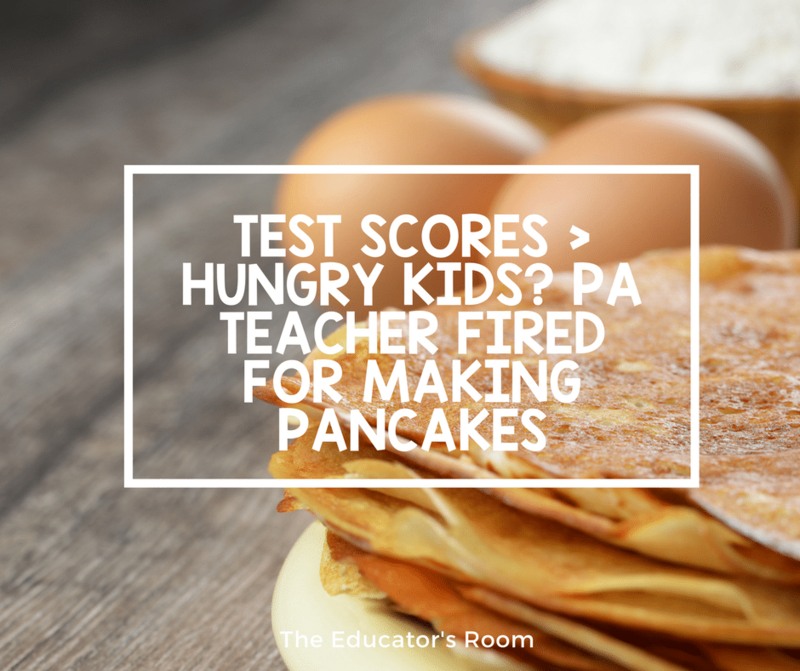 ), but if a teacher makes his students – 95% of whom are free and reduced lunch – pancakes during the tests, that leads to him being fired. This isn’t an article from satirical The Onion, but the rationality – or lack thereof – reads that way. What happened was Assistant Principal Marian Grill of Lancaster, Pennsylvania walked into a classroom and wondered why Kyle Byler, an 8th-grade social studies teacher at Hand Middle School, was doing for his students before the Pennsylvania System of School Assessment (PSSAs). What does the price of being “an awesome teacher” acting like a “school dad” earn a teacher in this circumstance? A spot in the unemployment line, apparently. First, it’s amazing to note that Byler cares enough for his students that he’d take the time to make the students breakfast before they take the test. I’ve made breakfast for students before. It takes hours. And it’s hours I often don’t have to dedicate early in the morning, especially when I’m trying to ready my family to get out the door on time. Second, if this occurred during any other day in the school year, would he have been fired? It’s hard for me to justify to any school board member on any day that this veteran educator made kids breakfast and that’s why he’s being terminated – let alone a day where every teacher in the Commonwealth of Pennsylvania hearkens the importance of a full night of sleep and a healthy breakfast in the morning. In Byler’s case, he couldn’t provide his students 8 hours of sleep. But he could give them – who, again, are nearly all on free and reduced lunch – a hot breakfast. On his own dime. In any teacher’s case (not just Byler), couldn’t we use our time more wisely? More productively? More about putting our students first? Like Byler? Fourth, whatever happened to let the punishment fit the crime? In what other professions would making breakfast lead to an immediate termination? Do we wonder why there’s a shortage of teachers? Why do teachers fear the repercussions of losing their union? Their say? Their advocacy? Their jobs? The Lancaster School District School Board will meet Tuesday evening to decide Byler’s fate. While I don’t know what to expect, I do hope (and imagine) that PA Secretary of Education Pedro Rivera, the former superintendent of Lancaster Schools, will get involved. Additionally, I imagine that the Pennsylvania State Education Association, an affiliate of NEA, will be suing the district for such heavy-handedness and to earn Byler’s job back. “I also think it would be justice to, rather than call for the firing of the oppressiveness administrators behind this egregious move, that they be punished. How? By making the students breakfast. Update: As of 4 pm EST on April 17, 2018, the decision to fire this teacher was not on the table. To read more, click here.